Evesham's debut doesn't have much trouble securing a Freeview Playback badge. Its plethora of features includes a huge 250GB hard disk alongside two digital tuners that enable you to record one channel while watching another. It's also possible to record two programmes as long as you watch one of them. Its gloss black frontage holds basic operational controls, a CAM slot for adding Top Up TV services and an LCD screen as well as a variety of logos and badges, including Freeview Playback. Connectivity is basic, but better than most. Optical digital and stereo audio outputs make it possible to use a home cinema amplifier and are a giant step-up from the Scart-dominated audio of lesser-skilled boxes that are available. 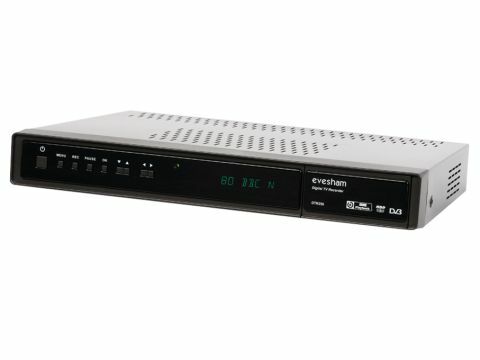 Video is fed to a TV via Scart, with another provided for outputting to a VCR or DVD recorder, while a composite video output and RS232 port complete the line-up. The enormous 250GB hard disk can store about 160hr of Freeview recordings, which are presented in a simple library that provides details of the date, start time and duration. There's also a bar that shows how much memory remains unused. A chasing playback feature means you can start watching programmes before they've finished recording, and a menu system helps you decide whether to watch it from the start, pick up from where you left off last time, manage chapters, rename recordings or, indeed, archive the entire programme - or part of it - to a DVD recorder. Using the library also leaves the last channel viewed playing in the background, but there are no pictures, just sound. A very similar timer menu lets you see all scheduled recordings remaining, unlike Sky+, and it's possible to set single, daily and weekly recordings although not, as yet, a series link. Another mainstay of that branding is the pausing and rewinding of TV. It's one of this model's skills, although there is a delay of five seconds or so before the (up to 2hr) buffer kicks-in, so you still might miss something. After resuming with the play buttons, you can scan through this 'time shifted' channel at speeds up to 32x. Its seven-day EPG gives you access to set recordings for a full week ahead and a vertical bar shows you exactly where you are in the schedule. It's even possible to expand or shrink the EPG so you can see what's showing for the following five or so hours all on one screen, although the programme titles are shortened so much it's almost impossible to tell what each programme actually is. While the EPG takes a second or two to load, the current channel carries on playing underneath the various shades of blue. Annoyingly, changing channels is unnecessarily difficult. Simply scanning the EPG and selecting a programme that's currently showing merely reloads the channel you were already watching. Instead you have to go through the timely process of pressing the 'OK' button again to access a full channel list and then move onto the channel you desire. Hmm. For all these features, the picture quality is fairly ordinary. Obviously these boxes are not built with HD Ready TVs in mind - despite their burgeoning popularity, because when viewed on a 40in LCD TV the images suffer from excessive picture noise and edges that break up almost constantly. Skin tones, too, look over-cooked and colour in general; is on the garish side. That's a shame considering its audio prowess and stops us from recommending the DTR250 for videophiles and anyone with a large screen TV, despite its extensive range of features.